Born in Brooklyn, New York, Pat Holden frequently dreamed about living and working in a country setting as a young girl. She subsequently spent the bulk of her career in New Jersey, first as a marketing professional for Eastern Airlines, and finally as the Director of Economic Development for the cities of Montclair and Milburn. 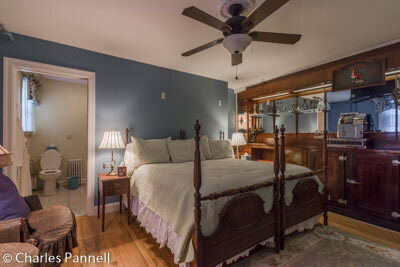 Ultimately she realized her childhood dream when she and her husband purchased the Red Hook Country Inn (845-758-8445, www.theredhookinn.com), in the city of the same name. And although Holden has traveled the world, she’s quite content these days to welcome visitors to her little piece of heaven in upstate New York. 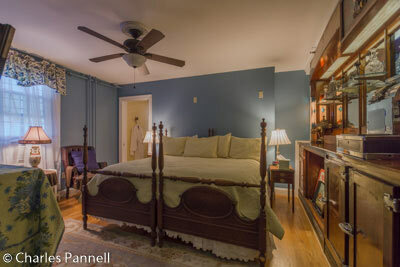 As soon as you walk through the front door of this quaint inn, you’ll notice a definite historic ambiance. The 1841 Federal Colonial building is just two hours from New York City, yet it’s a world away from the hustle and bustle of city life. Holden did an excellent job of decorating and furnishing this historic property with period furniture; and although this 10-room inn wasn’t at all accessible back in the 1800s, today it’s a good choice for some wheelchair-users and slow walkers. Accessible parking is available in a paved lot behind the inn, near a barrier-free path to the accessible front porch. The front entrance has a wide double door that will accommodate wheelchairs and scooters, and there is good pathway access to the registration desk. Room 9 — also known as the Taproom — is located behind the front desk. There is level access to the room, which is furnished with a 33-inch high king-sized bed with wheelchair-access on one side. The room is also adorned with a large art deco mahogany bar complete with a vintage cash register, hence the name “Taproom”. Top it off with a gas fireplace and you have a very cozy room. Holden gets top marks for her creative interior design, as you don’t find too many guest rooms with cash registers. 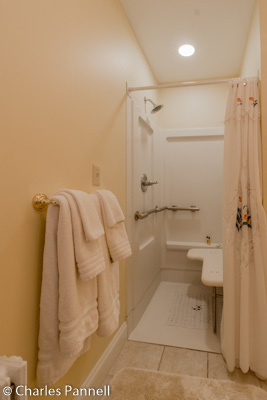 There is a wide pocket door into the bathroom, which is equipped with a roll-in shower with a fold-down shower seat, grab bars and a hand-held showerhead. There is also a large European showerhead in the 37-inch wide shower, and the shower controls are located within reach of the shower bench. 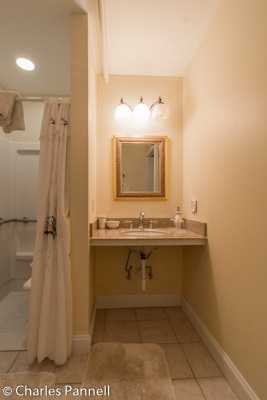 There is one small toilet grab bar on the right wall (as seated), but it’s located far in front of the toilet. There is also a roll-under sink in the bathroom. Additionally, the spacious room boasts a full five-foot turning radius, but the portable towel rack may need to be moved for full access. There is level access to the first-floor public rooms, including the front parlor which has a large fireplace and is furnished with turn-of-the-century pieces. The large front porch offers barrier-free access and is furnished with rocking chairs and comfy sofas. It’s a great place to relax and watch the rest of the world go by. Additionally, the property is located on the main drag and it’s close to several restaurants, so you can park your car for the evening and enjoy a pleasant stroll to dinner. 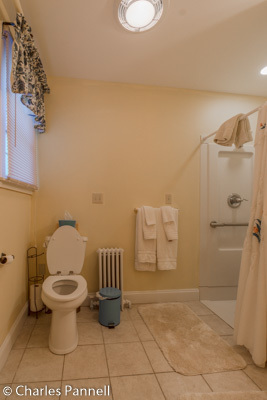 Although this property will work for many people, because of the toilet grab bar placement and the bed height, independent transfers may be difficult or impossible for full time wheelchair-users. That said, if you have someone to assist you, it’s a good choice for slow walkers and wheelchair-users who can walk a step or two. It’s important to note that it is an old house, not a reproduction, so if you are expecting something modern, then this place isn’t for you. Still it’s a lovely property if you can manage it, and it’s the perfect place for folks who appreciate history. It also makes a good home base for a historic Hyde Park visit.